As you have probably seen Rottweilers have had some pretty bad press, but with the right training they can make great family pets. They are classed as a giant breed as they grow between 23″ to 27″ (58 to 68cm) tall and can weigh between 90-120 pound (41 t0 54kg). Their coat only comes in one colour mainly black with tan markings and is easy to maintain only needing to be brushed twice a week to remove dead hair. Rottweilers are not suited to apartment living due to them being such a large dog with lots of energy. They are best suited to a house with a large garden, bearing this in mind an adult dog will still need at least one long walk a day. Rottweilers are loyal, confident and protective and can be very head strong especially adolescent males. The ideal owner would be somebody who can be confident, firm but also patient. All Dogs4Us Rottweiler puppies come with a six month guarantee and are temporary vaccinated, wormed and microchipped for identification. 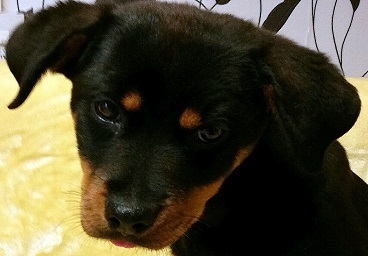 Please call us prior to visiting should you be interested in buying a Rottweiler puppy, so we can check availability. To find out more about Rottweilers and to check availability contact us at Dogs4Us. Take a look at some of the Dogs4Us Rottweiler in their forever homes and don't forget to upload your Dogs4Us Rottweiler snaps to join our family galleries.